Who does’t like to ride a kick scooter? We all rode one when we were kids and it was really fun. A kick scooter is probably the first thing a growing kid learns to ride and roam on it around the neighborhood. Now, when we go to buy a scooter for our own kid or just want it as a gift for a kid, we really get confused. There are a variety of options available for kick scooters. Different types of kick scooters are targeted to kids with different ages and also with different needs. 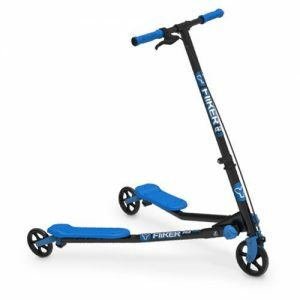 So to help you buying the perfect kick scooter, we made a list of ten scooters among hundreds of them. All these scooters are of different types and vary in size and features. So without any more delay, let’s look at our list of scooters and find out what we have for the kid you love. 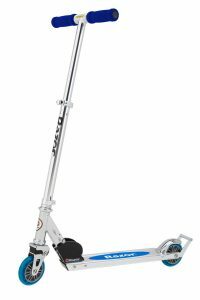 Urban 7XL Deluxe is among the best kick scooters available in the market. 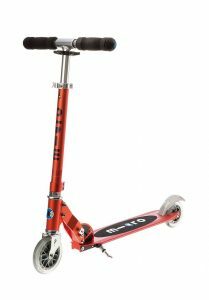 Kick scooters are mainly designed for kids, but this one can be used by adults too. This scooter is very nicely made and has an aluminum body. The scooter weighs only 14 pounds and is perfect for any kid to handle. The scooter is also very rigid and strong and so an adult can also use it without any worries. The scooter has a height adjustable handle. The height can be adjusted anywhere between 36 inches to 39 inches. So, this is a perfect one for a growing kid. Even the maximum handle height is perfect for an adult to ride on it. The length of this scooter is 37 inch and width is 5.5 inch which makes it perfect to handle and even you can put both your feet on the scooter. The base of the scooter is also 4 inch above the ground. So it can easily avoid the little bumps on the road. To stop the scooter, you need to use your feet to step on the brake on the rear wheel. There is no handle brake which is a bit disappointment. This scooter has a very good suspension system. Two suspensions are fitted to both the front wheel and the rear wheel which make the ride even more comfortable and fun. The scooter is very portable too. You can easily fold the scooter and put it in your car’s boot easily. It also has a carrying strap attached so that you can carry it around without any trouble. You can also choose this one from a variety of color options available. This is a 37 inch long Scooter. It is 5.5 inch wide, stands above ground 4 inch. 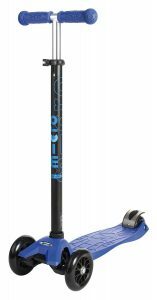 The handlebar is adjustable anywhere between 36 inches to 39 inches. The handles are cushioned with extra-thick foam for more comfort and also control. It has dual clock suspension on the front wheel and also a rear wheel suspension. The wheels of this scooter are 8 inches in diameter and are PU wheels. These are very good and work well on rough roads too. This scooter is very easy to fold and there is also a strap which comes very handy while carrying it. Razor is one of the biggest players in the kick scooter market. Razor A2 kick scooter is the successor of their iconic original A model. Razor A was their first scooter in the market which gained a huge success. Razor A2 is a compact scooter and is perfect for kids of age above 5 years. The scooter is 34 inches long and 26.5 inches wide, which makes it a perfect one for the kid to handle in terms of dimensions. That makes this a good one to ride on road bumps even. A2 is made of Aluminum and is very light. The weight of this scooter is mere 6 lbs but it is strong enough to take a load up to 143 lbs. Razor A2 has a 3 stage handlebar adjuster which makes it perfect for a growing kid. For safety, Razor installed a rear fender brake on this model. Razor also patented this brake model and it proved to be a really good one. The wheels of this scooter are urethane wheels. These wheels perform very well on rough roads. For a smooth ride, Razor also put a springless wheel shock suspension system on the front wheel. The scooter is very sturdy. The T-tube and deck, both are made of aircraft grade aluminum. The scooter has adjustable handle bar. It is very easily foldable too. The brake is a rear fender brake and is also patented by Razor. This scooter has Urethane wheels which perform very well. 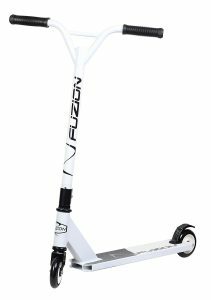 Fuzion X3 Pro is one of the best scooters for a growing kid. This scooter targets only the kids above 7 years. The built of the scooter is very good. It is built with aluminum and so it is very light but strong. The weight of this scooter is only 7.1 lbs, perfect for a kid to handle. Though lightweight, this scooter can handle a kid who weighs 140 lbs. X-3 Pro is very nicely designed. The scooter is only 20 inches long and 4 inches wide. The handlebar is 18 inches high from the deck and the bars are made of tensile steel and designed like bat wings. The rectangular design of the deck is very unique. This scooter has 100mm cast pneumatic wheels on it. There is also ABS wheel scores for safety. X3 Pro also has flex brakes attached to its rear wheel which makes it very easy to stop. If you want to get Fuzion X3 Pro, you can choose it from a variety of 5 colors. This scooter has a dimension of 20 inches by 4 inches. The bar in this scooter is 18″ high tensile steel batwing bars. This kick scooter is equipped with 100 mm cast pneumatic unit and ABS wheel cores. 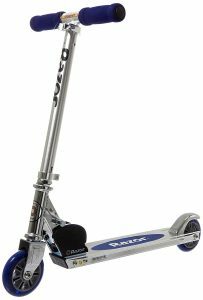 This scooter also has ABEC 9 bearings which are very good in performance. Fuzion X-3 Pro has steel flex brake attached to the rear wheel. OxGord is a three wheeled scooter with two wheels on the front and one on the rear. This design makes the scooter very stable and safe to ride. The frame is made of aluminum and body is made of carbon steel alloy. This makes the scooter lightweight and easy to handle. The T-handlebar is also adjustable. The scooter is easily foldable and it is very compact. The scooter can be easily stored in a small space and perfect to travel with. The wheels of this scooter are PU wheels and are very smooth to ride. The bearings attached to the wheels are of very good quality and it reduces the vibration while riding. To stop this scooter, the brakes are attached to the rear wheel. It is a step on the brake and very effective to stop the scooter. The three wheel design of this scooter is very stable. The body is made of aluminum and carbon steel alloy. The wheels of this scooter are PU wheels. For safety, there is a step on rear wheel brake which is very effective. The scooter is easily foldable and easy to travel with. The Micro Mini Kick Scooter is a Swiss-designed surfboard on wheels. Its design is intended to teach kids about shifting the weight of their body to turn the scooter either left or right. In other words, toddlers have to learn how to lean while maintaining balance. The two front and one rear wheels are made of high-grade polyurethane while the wide-bodied deck has been dutifully layered with flexible fiberglass. This combination allows for optimum strength, sturdiness, and structural integrity while the wheels allow for a smoother ride. It has a weight limit of 44 lbs. The unique 2-front wheel configuration plus the lean-to-turn mechanism is quite ingenious. The deck is low enough so toddlers can safely land when out of balance. It’s ideal for teaching kids about shifting their weight to change direction which enhances their sense of balance. 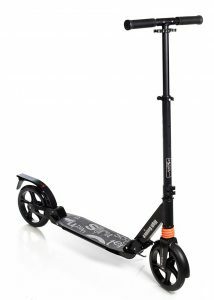 This scooter has a Swiss design and is engineered and constructed for superior durability. Every part on the Micro Maxi Kick Scooter is replaceable – this allows it to last, virtually forever. The quality of this scooter is good and is suitable for kids between the age of 5 years and 12 years. This scooter has lean-to-steer technology which helps the kids to learn to steer very well. Yvolution Y Fliker Air Push Swing Scooter is the most different type of scooter in our list. In fact, it is not even a kick scooter. It is a three-wheeled scooter and there is no need to kick to move forward. To accelerate, the rider just has to do is sway his hips from side to side. This scooter is has a very unique and effective design which boosts the smooth performance carvings and drifting actions. The performance-rated wheels provide the support for necessary drifting and carving. These wheels are very smooth which makes the ride very comfortable and fun. Yvolution Y Fliker Air Push Swing Scooter has a twist-and-stow folding system to achieve a compact fold. It can be folded very easily in no time. There are enhanced-grip footplates for superior grip and performance to enhance drifting capabilities. This scooter is also available in a variety of colors and suitable for all the kids above 7 years of age. This free-style scooter performs smooth carving and drifting actions. Riders simply need to move their hips and legs from side to side to get going forward. Yvolution Y Fliker A3 Air Scooter can take a maximum weight of 176 lbs. This scooter is 37.13 inches in length and 24.61 inches wide. The height of this scooter is 37.20 inches. Micro Sprite Kick Scooter is another one on our list. The price of this scooter is in the premium range but it is balanced by the quality of it. It is a very nice scooter and is meant for kids of age above 13 years. This scooter can also take the weight of a lightweight adult. 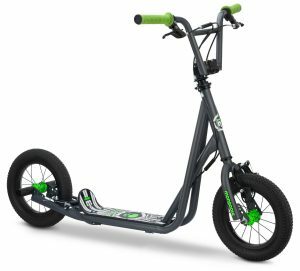 The body of this scooter is made of aluminum which makes it very solid and lightweight. Micro Sprite weighs only 5.5 lbs. Both the front and rear wheel are made of polyurethane. The wheels are very good in performance and smooth to ride. This scooter is entirely made of modular parts. So any part of this scooter is very easily replaceable. The handlebar of Micro Sprite is also adjustable. It has a three stage adjustment options, so there are no worries for a growing kid. The maximum height of the handlebar is 34 inches above the deck and 37 inches above the ground. This scooter is very easily foldable and can be carried around very easily. It is very compact and fits the boot of the car smoothly. It is also available in various colors. The construction of Micro Sprite is very solid. It is made of aluminum. The wheels are made from polyurethane, which is very good in performance and also guarantees a smooth ride. This scooter has a modular construction and so every part is replaceable. The weight of this scooter is only 5.5 lbs and it can hold a load up to 220 lbs. The height of the handlebar is adjustable and has 3 stages. It can extend up to 34 inches above the deck or 37 inches above the ground. Mongoose Expo Scooter is simple meant for rough riding. The scooter is portable yet very responsive in riding. It is designed for 12 years and above kids but is also suitable for adults. The most prominent feature of this scooter is its wheels. These are 12 inches in diameter and are equipped with pneumatic tires. The performance of these wheels is excellent on both paved and unpaved surfaces. This scooter has an aluminum body. The deck of this is extra wide which increases the stability of the scooter. This has caliper brakes on both the wheels. The only disadvantage is this scooter is non-foldable. Mongoose Expo has 12 inches pneumatic tires. These tires are very smooth for riding on all types of surfaces. The solid frame and the body are made of aluminum. Both the wheels have caliper brakes attaches to them, which makes the bike safe to ride on. The maximum weight this scooter can take is 220 lbs, which makes it suitable for adults too. Razor A is the original scooter model by Razor. Razor entered the kick scooter market with this model and it proved to be a huge success for them. The scooter is mainly for kids and is suitable for any growing kid of five years and above. 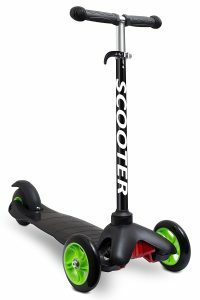 The dimension of this scooter is 23.9 inch x 11.3 inch x 32.4 inch. The frame and the body are made of aircraft-grade aluminum. The build of the scooter is very solid yet very light. The weight of the scooter is only 5.5 lbs but some with weight up to 143 lbs can ride on it. Both the front and rear wheels are urethane wheels. These are quality wheels and perform well on smooth surfaces. But they are not meant to ride on rough surfaces. For safety, the scooter has a step-on fender brake on the rear wheel. This brake is patented by Razor and is used on the various models of Razor scooters. Razor A also features a wheelie bar. This is something very fun to play with but kids have to be a little bit careful. This scooter is easily foldable and can be carried around. The body of this scooter is made of aircraft-grade aluminum. This makes the scooter very light weight. The weight of this scooter is only 5.5 lbs. The 98 mm diameter wheels are inline-style urethane wheels. These wheels are attached to an ABEC 5 bearing. The rear wheel has a fender brake which is operated by stepping on it. This brake is patented by Razor. Razor Tekno is another model from Razor in our list of kick scooters. This scooter is exclusively for kids and has very cool attractive features. 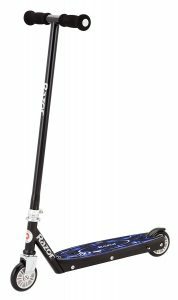 Just like any other Razor, this scooter is also made of aircraft grade aluminum which makes it light and strong. The dimensions of this scooter are 23.5 inches in length, 11.2 inches in width and 32.9 in height. This scooter has 12 LED blue lights attached to the deck. These glowing LED lights are gorgeous when turned on, and are something which attracts the kids very well. To power these LEDs, two CR2032 lithium batteries are installed. These are very easy replaceable batteries. The handlebar is very right but it is non-foldable. Even you cannot adjust the height of the bar. Razor has its signature fender brake attached to the rear wheel to stop this scooter. Razor also has the urethane wheels on this scooter for both front and rear. This scooter is available in five different colors. Razor Tekno has a dimension of 23.5 inches in length, 11.2 inches in width and 32.9 in height. The scooter is non-foldable. This scooter is made of aluminum like any other Razor scooters which make it light and rigid. The deck is a polypropylene deck and there are 12 blue LED lights inside it. It has Razor’s signature fender brake on the rear wheel and also urethane wheels for both front and rear. We have discussed enough on various types of scooters for kids. All these scooters are with different features and one might get really confused when buying one for his/her kid. So here are some basic things which you should consider while buying a scooter. While buying a scooter it is very essential to consider the scooter with the appropriate size. If you choose a scooter which is too big, it will be very tough for a kid to handle it and also makes it dangerous. Weight. You should always consider the weight of the scooter while buying. It is always good to choose a scooter which is light weight. If the scooter is light, it is easy to kick and make it move forward. If the weight is less it will be easy to handle for a kid. Adjustable. While buying a scooter for a kid, always look for if it is adjustable or not. Kids grow fast. So if you choose a scooter which is just the appropriate of your kid today, it may not be after two years. So always look for a scooter whose height can be adjusted so that the same can be used for a long time. Age of the rider. Always consider the age of the rider for whom you are buying the scooter. Do not end up buying a scooter for a toddler which is meant for teenagers. Safety. Always consider safety features of the scooter before buying them. Check the type of brakes and their effectiveness.